Manchester City were brought crashing down to earth on Wednesday night, just three nights after they had pocketed the first available silverware, in the form of Capital One Cup, of the season. Liverpool, having been outplayed at Wembley, came roaring back and beat City, emphatically, by 3-0 in the Barclays Premier League encounter, and became the second team this season to do the league double over the 2013/14 English champions. Winning the League Cup was expected to rev up the Cityzens, but Wednesday night’s performance was dire and lacked any sort of sharpness. The defeat to Liverpool was City’s third consecutive in the league, with Manuel Pellegrini’s side now in serious danger of dropping out of the top four. They have 47 points from 27 games and still have to visit Stamford Bridge, St. Mary’s Stadium, St. James’ Park, to name a few. Though many City fans have been terribly disappointed with their side’s showings for a lot of this season, I do not think there is an enigma to City’s continued struggles. This article puts City’s consistent losses into perspective. This article puts City’s consistent losses into perspective. Enjoy reading. Despite the additions of Kevin de Bruyne and Raheem Sterling, City have not improved as an attacking unit from last season. The Belgian attacker has had a great first season and does not have much to prove when he returns to action from his knee injury. Sterling has done reasonably well while still having to make a few improvements to his game. But, City continue to rely, quite heavily, on the Sergio Agueros, Yaya Toures and the David Silvas, meaning their opponents have not had a different challenge to rise up to when playing the Blues. This aspect was easily noticeable on Wednesday night, when Silva played ordinarily, Aguero lacked his usual sharpness and City did not have a player to lead their attack. A total of four chances created and four shots attempted is evidence enough to say that City were ridiculously clueless. Many times this season, it has been a case of City relying on Aguero or de Bruyne to get them over the line. They have seldom played as a unit for well over four months now and it’s understandable why they have failed consistently in the last month, losing four of the six games played since February 6. Some people might point their fingers at the backline’s failure to stymie the opposition’s attackers, but City pride themselves in outscoring teams. And they have not showed enough attacking ammunition to worry their opponents. You cannot also be oblivious to the number of injuries City have had to contend with during this season. Most of their marquee players have been out for long periods, with at least five of them – Aguero, Silva, de Bruyne, Wilfried Bony, Samir Nasri – being attacking players. De Bruyne, given how he has impacted City with his direct style of play, has been a huge miss. Against Leicester City and Tottenham Hotspur last month, City were extremely blunt with their attacking play. They always hit brick walls, and I just think de Bruyne, with his dangerous crosses and ability to strike the ball cleanly, could have made them more lethal as an attacking unit. Without de Bruyne, City have not been able to play direct. And with an out-of-form Silva and a still-learning Sterling, City have looked a little narrow because of the duo’s propensities to cut inside and occupy the central areas. Playing Navas on the right-hand-side does not have the desired effect if a centre-forward with aerial ability does not play, which has not been possible because of Bony’s injuries and Pellegrini’s reluctance to deploy his team in 4-4-2 for much of this season. With Aguero not having balls played to his feet, he has drifted out wide or come short on many occasions to link play and also to feel the ball. What it has done is, left City light upfront and with no focal point. Therefore, they have not gone anywhere with their attacks. Coming to their defensive game, City have made some elementary errors like getting caught out of position, not being agile to a situation and overly dwelling on the ball. City’s opponents have made them pay for even the slightest mistakes which, I should admit, have been plenty on offer this season. 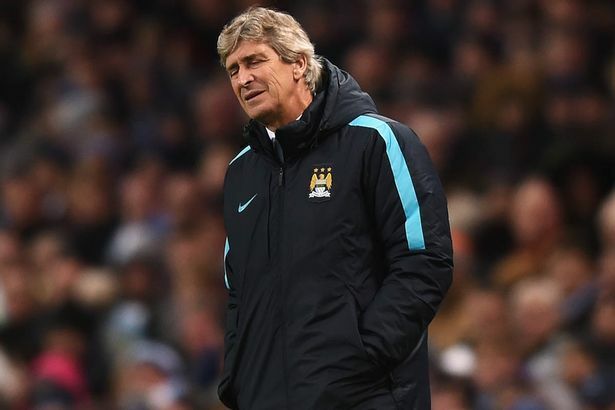 How City finish this season hinges on whether or not they improve their attacking potency. Only if they start scoring goals freely again will City be able to win games and move up on the league table. I do not think there is any particular reason for City’s struggles against the current top six teams in the league, and neither should it be a worry. In a league season of 38 games, you get to play a team only twice, that too at different stages when you maybe are out of form. City’s struggles against teams like Liverpool, Leicester and Tottenham, have been a consequence of them not carrying any sort of attacking threat.